June 2, 2017 - Residential property sales in the region totalled 4,364 in May 2017, a decrease of 8.5 per cent from the 4,769 sales in May 2016, an all-time record, and an increase of 22.8 per cent compared to April 2017 when 3,553 homes sold. Last month's sales were 23.7 per cent above the 10-year May sales average and is the thirdhighest selling May on record. 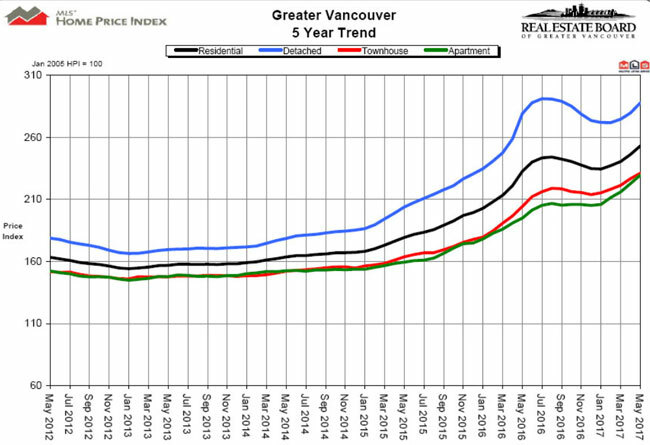 "Demand for condominiums and townhomes is driving today's activity," Jill Oudil, Real Estate Board of Greater Vancouver (REBGV) president said. "First-time buyers and people looking to downsize from their single-family homes are both competing for these two types of housing." The sales-to-active listings ratio across all residential categories is 53.4 per cent. By property type, the ratio is 31 per cent for detached homes, 76.1 per cent for townhomes, and 94.6 per cent for condominiums. Generally, analysts say that downward pressure on home prices occurs when the ratio dips below the 12 per cent mark for a sustained period, while home prices often experience upward pressure when it surpasses 20 per cent over several months. "While sales are inching closer to the record-breaking pace of 2016, the market itself looks different. Sales last year were driven by demand for single-family homes. This year, it's clear that townhomes and condominiums are leading the way," said Oudil. "It's important to work with your local REALTOR® to understand the different factors affecting the market today."